Necklace length is approximatley 90cm long. Approximatley 9mm white fresh water pearl elongated. 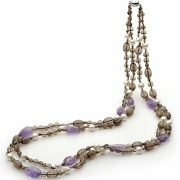 Smokey Quartz, Amethyst and Fresh water pearls are used in this Necklace.